The Blue Devils completed their three-day sweep of the 2007 Drum Corps International World Championships Saturday night, winning the final show of the season in impressive fashion with a 98.000 and sweeping the Brass, Percussion, Ensemble Visual and General Effect caption awards. 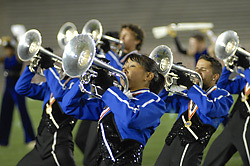 After being passed by the second-place Cadets in two of the final events of the scheduled season, the Concord, Calif.-based Blue Devils surged in the final two weeks to take the corps' 12th overall World Championship. The crowd included many alumni celebrating the corps' 50th anniversary at the Rose Bowl, practically in the Devils' backyard. "I've been involved since '74 and this is by far the biggest show, the biggest win, the biggest performance ever by the Blue Devils," said corps director David Gibbs. "I don't know if we can ever top this one. It's very, very special. It's been an incredible year." Gibbs attributed the corps' end-of-season push to the members: "The kids are awesome. They are just tremendous performers, way past what I thought they could achieve. It's amazing what they've done this year." 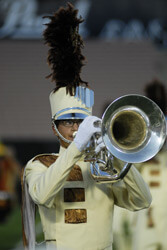 Blue Devils members comment on the corps' World Championship title. The Cadets took second place with a 97.025. "The corps did very well tonight and we're very proud of them," Cadets director George Hopkins said. "The season was an absolute success. Our season got off to a rough start but our conviction and hard work allowed us to make this show something that a lot of people appreciate and the kids enjoy, which is the most important thing. There are always things you do that you wish you could go back and change, but all you do is learn. I've been learning for 25 years, and I learned a lot this year." Though the top three spots had been tightly contested throughout the Championships weekend with a Semifinals spread of about half a point, the Cavaliers settled slightly, taking third place with a 96.350. The corps also won the High Guard caption award. Despite unsuccessfully defending the 2006 DCI Championship, the corps had nothing to be disappointed about, said director Jeff Fiedler. "We've never based what we do on our placement; we base it on what we achieve with our show and our performance, and these kids maxed this show out. The activity's great and things are going well, so I can't be disappointed," Fiedler said. "The guys are already very excited about next year." Phantom Regiment remained solidly in fourth place with a 94.850. The show's ending, a reference to Phantom's famed 1996 "Defiant Heart" show, was a crowd favorite throughout the weekend. "We're really happy for all the corps members right now. The members really stepped up their performance level each night throughout the season, and tonight was just a fabulous performance," commented director Rick Valenzuela. "Watching them perform tonight was just amazing." The Santa Clara Vanguard retained the fifth place ranking it earned in a surprising jump in Friday's Semifinals performance. The corps' score jumped almost a point over the course of the weekend, ending at 94.175. "It was a close race tonight and it's really great to be where we ended up," said director Jeff Pearson. "There was great competition this year with many great drum corps, and we certainly brought it tonight. The corps did what they came here to do and that was great for me and the staff to see. This season has just been a lot of fun and the members have done very well." Carolina Crown remained in sixth place and also earned the Spirit of Disney Award, given to the corps whose show best exemplifies the ability to translate imagination into an educational and fun forum for all participants, and to provide great entertainment value for the audience. "We built the show for the crowd, for entertainment purposes, and to get the kids to understand what it is to entertain a crowd," said Carolina Crown tour director Jim Coates. "Tonight was the best show of the year. The members brought it to the last one, and we can't ask for anything more. It's been a great summer and a lot of great drum corps, and these kids are fabulous." The seventh-place Bluecoats finished a mere .1 point away from Crown with a 94.05. Carolina Crown, Bluecoats, and Santa Clara Vanguard flipped many times throughout the end of the season in a bid for the top six; just .125 points separated the three corps on Saturday evening. "I just think that all of us are so, so good that it's almost a toss-up," said Bluecoats director David Glasgow. "Any given night with those three or four groups, anyone could win. It makes it exciting. I congratulate the groups that are ahead of us because I'm sure they had wonderful shows and wonderful programs. But it's been a great, great season for all of us so there's nothing to be ashamed of and everything to be proud of." Rounding out the top twelve were Blue Knights, eighth with a 90.275; Boston Crusaders were ninth at 89.100; Colts gained a place to finish at 10th with an 86.150; 11th-place Glassmen at 85.75; and Spirit from JSU with an 84.5.